One of the most interesting (and polarizing) new color options for the Galaxy S10 lineup is called Canary Yellow. It's reserved for the more affordable Galaxy S10e, which is likely going to come in a handful of lively hues, and has been a divisive topic due to its shocking appearance. Samsung's Canary Yellow, you see—or at least what we've seen in renders so far—is not like a 'regular' yellow, but a more garish shade that really seems to 'pop'. 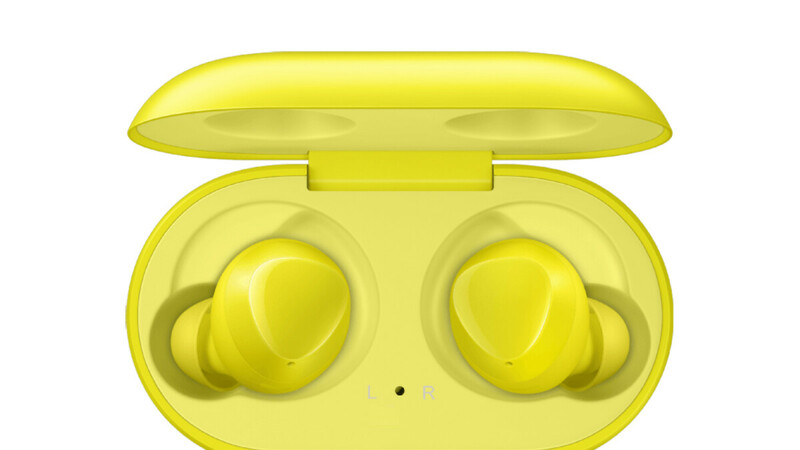 Newly leaked press images of Samsung's upcoming wireless earbuds—aptly named the Galaxy Buds—seem to confirm that the accessory will also be available in Canary Yellow. The images, published by Winfuture.de, show the Galaxy Buds neatly tucked inside their protective wireless charge case. Both the earbuds and the case itself are colored in the aforementioned blinding shade of yellow. What's even more interesting, though, is that the leaked images also confirm that the Galaxy Buds will be 'Tuned by AKG.' This hardly comes as a surprise following Samsung's 2016 acquisition of Harman-Kardon. This gave Samsung access to the JBL, Harman Kardon, Mark Levinson, AKG, Lexicon, Infinity, and Revel brands. Since the purchase, Samsung has been bundling earphones with its flagship devices carrying the AKG brand. The upcoming Galaxy Buds will seemingly continue the tradition. There's no official word on when the Galaxy Buds are going to launch, but we wouldn't be surprised to see them go on sale around the same time the Galaxy S10 hits the market. Lol and why exactly are you triggered? That's not a triggered comment. It's a true one. In all fairness, you need to mention how ugly it is everytime you talk about it. Last time they wrote about the yellow S 10E, I thought maybe they're exaggerating, then few hours later I used the yellow Spen in my Note 9, and realized how ugly the color is. There's nothing ugly about the yellow Spen. If that shade is ugly then every damn color is ugly. If it is indeed ugly to you, it took you 6 months to realize that? Why are you fanboys so butthurt over my opinion? Lol I have the blue Note 9, and yes, I find the color super ugly. And no, it didn't take me 6 months to realize that, more like 6 seconds, but there was no article about this for me to share my opinion about it. Funny how fanboys are now butthurt over colors, you can't dare and criticize specific colors anymore. If you mean me, show me where i mention it in EVERY article. I believe he is talking about the writer. The color looks like a variation of high viz yellow. It's slowly growing on me. Gonna look like ear wax build up. Am I the only one missing the wing tip? Like it on the phone, not so much for these. Black buds do look the best. Yeah, not everything looks good in every color. If they sound like anything like the akg 100y wireless buds then these will be a major go! Those are the best wireless buds song quality wise on the market! Nice color actually, very giallo evros (Lamborghini), but lighter. Performance wise, there akg, so they should be good. The best? Wait and see. Didn't know Sammy acquired Harmon Kardon,wow.